Chip Harrison is dating Melanie Trelawney, a rich young woman who is slumming in small apartment in New York, and has taken a job as assistant to Leo Haig, a self-declared genius detective and tropical fish breeder. Two of Melanie’s five sisters have recently died in unusual circumstances and fears for her life. Chip arrives at her apartment to find her naked and dead on an inflatable bed, having apparently taken an overdose of heroin. While the police conclude it was a suicide, Chip is not convinced and nor is his boss. Together they start to investigate, worried about the safety of the two remaining sisters. 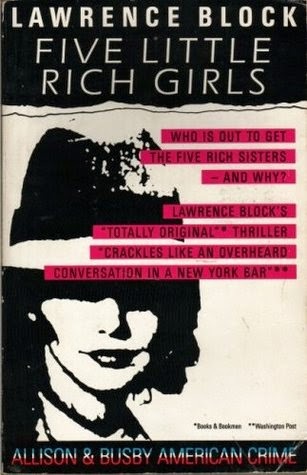 First published in 1974, Five Little Rich Girls was published in the US as Make Out With Murder. It’s a somewhat tongue-in-cheek PI tale, with a fair splattering of in-gags for fans of crime fiction, with the central character’s boss being a mystery novel aficionado seeking to ape the success and notoriety of Sherlock Holmes and Nero Wolfe amongst others. The tale is written in the first person from the perspective of Chip Harrison, a high school drop-out and street smart young man, who investigates the suspicious death of his girlfriend and two of her sisters. Whilst the story starts out as a parody it progressively takes the investigation more seriously, turning into a genuine whodunnit. It never quite loses its light hearted, sometimes improbable nature, and at times is quite racy. Overall, an okay read that got better as it progressed. DI Jack Carrigan has a troubled personal past and is considered something of a maverick within the London Met, singly obsessed with solving cases in his own way. His new investigation concerns the horrific death of Grace Okello, a Ugandan student studying at the School of African and Oriental Studies, who was undertaking her thesis on rebel leaders and child armies in Africa. Carrigan’s boss places the equally marginalised DS Geneva Miller into Carrigan’s team to monitor his actions. Carrigan and Miller don’t see to eye to eye, with Miller pursuing a different line of enquiry to her boss. As the murder breaks in the media the team is placed under increasing pressure to solve the murder and it soon becomes clear that others are interfering with the investigation and Carrigan has other personal baggage. A Dark Redemption is a police procedural with a strong political inflection concerning rebel child armies in Northern Uganda. The strength of the story is its nice prose and cadence, the contextualisation and the handling of the subject matter, and a nice sense of place with respect to the seedier parts of London. Carrigan and Miller are both troubled cops who are struggling in their personal lives and at work. 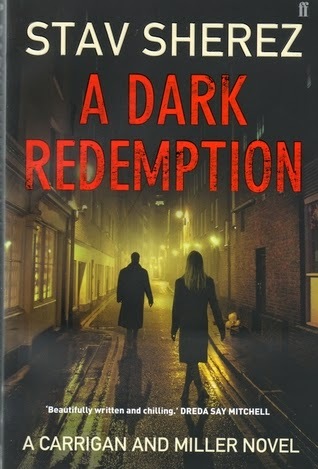 In A Dark Redemption, Sherez focuses in particular on the back story of Carrigan and his approach to the death of a Ugandan student, though Miller has more substance than a one-dimensional side kick. Similarly other characters are nicely penned, such as a London-based political activist. The plot was interesting and compelling, though some elements didn’t quite ring true, and there is a reliance of plot devices at times. There is though a nice twist towards the end that I didn’t see coming. Overall, an engaging police procedural that tackles a weighty political issue head on. 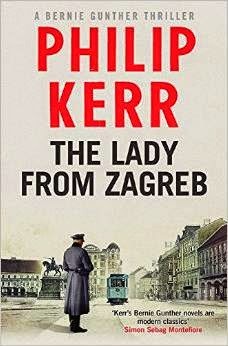 I see that Philip Kerr has a new Bernie Gunther novel published in early April, The Lady of Zagreb, set in Zurich in 1942. I'm giving a talk in the city in early May, so the book's dropped into my shopping basket (plus I've read the other nine books in what is a very good series). Also Ben Pastor's next Martin Bora novel, Tin Sky, is released a week later. I think that needs to drop into the basket as well. Expect reviews in a few weeks time. ‘You’re a liar and a cheat!’ Sammy snapped. ‘You were crazy to bluff on a weak pair,’ Donald muttered. ‘Well, you judged me all wrong!’ Sammy flipped the table to one side and lunged forward. A sharp upper-cut snapped his head back. Fourteen year old Helen Bassam has plunged twenty three stories to her death at the base of a residential tower block. In the months before her death she’d gone off the rails, reacting badly to her parents break-up. It’s not clear though why Helen was in a strange part of town or whether she jumped or was pushed. DI Joe Faraday starts to investigate but immediately runs into issues of resourcing and interference from his career focused boss. Competing for manpower is the head of the Major Crimes Squad after a local lowlife is found hanging from a tree wearing women’s knickers. Dragged into his team is DC Paul Winters, a cop with a knack for solving cases but a reputation for not always doing so in an professional manner. 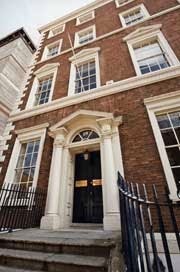 Both cases plunge Faraday, Winters and their colleagues into Portsmouth’s netherworlds of abject poverty, broken families, feral and abandoned children, thieving and selling stolen goods, and brutal organised fights. 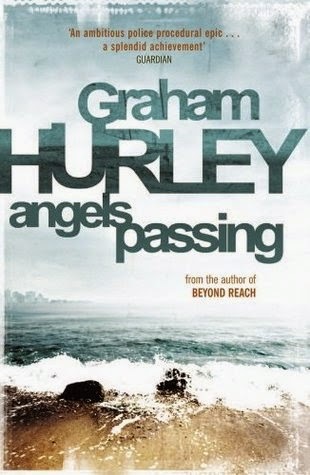 Hurley is probably the foremost British proponent of gritty, social realist police procedurals. His books vividly capture the methods, personalities and personal relationships, and the politics of policing, as well as the people, places and situations the police deal with on a daily basis. Hurley provides a warts and all portrayal of Portsmouth, its micro-geographies and social divisions, and its bleak underbelly. In Angels Passing, the fourth book in the DI Faraday series, the tale weaves together two main plot lines, one concerning the death of a teenage girl, the other the murder of a low-level criminal. 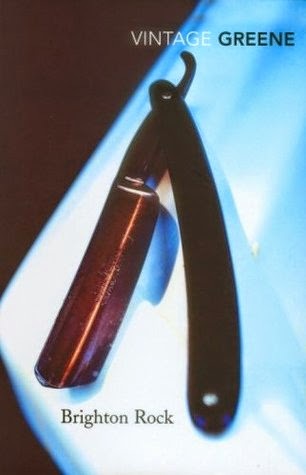 Where the book excels is in charting the police investigations, noting their complexities and their inherent internal tensions and games, in the characterisation of police, victims and criminals, and in the sense of place. Both main plotlines were interesting, coupled with a nice subplot concerning Faraday’s domestic life, though the denouement felt a little too contrived. Nonetheless, Angels Passing is a compelling, gripping and gritty read, though probably not recommended by Portsmouth’s tourist offices. Unsure what to do with his awkward, gangly child, Mort’s father takes him to the local village fair in the hope that he is offered an apprenticeship. The last boy left, shortly before midnight a stranger arrives on a large stallion and offers Mort a post. But being Death’s apprentice is not quite what Mort has in mind, especially when his new master seems distracted, his adopted daughter is distant, and his manservant standoffish. After only a couple of mentoring trips, Mort is tasked with shepherding two souls into the afterlife. But rather than simply witnessing Princess Keli’s death he intervenes, slaying her would-be assassin, altering fate and history. It’s not the wisest of career moves, but rather than coming clean he persists with his folly. The recent passing of Terry Pratchett prompted me to scan along my shelf and half of his books to re-read one. Mort was the most obvious given the topic is death and one of its two principle characters is Death. 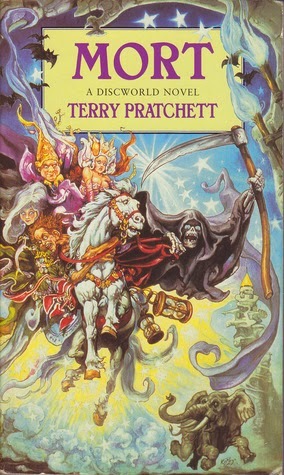 Through a story that’s a kind of sorcerer’s apprentice for the Discworld, Pratchett approaches death, fate and history with his usual wit, imagination, invention and humanism. The characterisation is excellent, especially Death and his mid-existence crisis. Whilst the story is quite linear it’s difficult to fault its execution, being entirely captivating and it was a rare moment when I didn’t have a smile on my face. In the tale Pratchett speculates that when one dies they get the afterlife they foretell, in which case I suspect he’s now playing the role of Mort and no doubt loving it. I received a letter last week from the Royal Irish Academy informing me that I have been elected a member. They elected 15 people in total, slightly more than the usual 12, and I was only one of two social scientists who got the nod (which is somewhat disappointing). A nice honour, though I'm not really sure what it means as yet other than I can put MRIA after my name. The formal admittance ceremony is at the end of May when no doubt I'll have to dig the suit out of the wardrobe and wear some fancy robes. It's followed by an induction seminar, which I hope is code for 'wine reception'. ‘I guess there’s no better place for a crucifixion than a national seminary,’ Carter muttered, staring up at body, the arms outstretched. ‘It’s a lay university now,’ the garda replied. Luckily we just about got to see the 90% partial solar eclipse over Ireland this morning - there was a slight break in the cloud for a couple of moments and it even got so bright we had view it using binoculors projected onto a card. It didn't go as dark as I thought it might, but the birds did go quiet. Lord Peter Wimsey is driving across the English fens at night in a snow storm when he loses control of his car and slides into a ditch. Along with his manservant, Bunter, he abandons his vehicle and sets off towards nearby church bells. They are greeted by the local rector, who offers to put them whilst his car is rescued, and Wimsey is soon invited to help ring in the new year. Shortly after a body with a disfigured face is discovered in the wrong grave and Wimsey starts to investigate, uncovering local secrets as he tries to solve who the victim is, why they were murdered, and by whom. I’ve had The Nine Tailors on the shelf for quite a long time. I’ve opened it on a couple of occasions, but was never really sure I was in the mood for an English rural cozy from the golden age of crime fiction. Having now read the book I’m fairly confident that if I had carried on reading in the past my mood would have quickly changed. Sayers’ book rightly deserves plaudits for being a classic crime fiction tale, ticking all the key boxes - intriguing and clever plot, a thorny puzzle, excellent contextualisation, nice characterisation and interaction between characters, a strong sense of place, and literary prose. Essentially the tale is a whodunnit set in a small English village in the fens, centred on a Church and its bells, and the legacy of a robbery some twenty years previously. The plotting is intricate and well executed with minimal use of plot devices, and while the tale strays a little from social realism at times it nevertheless hangs together coherently and is rounded off with an ingenious but plausible denouement. Sayers clearly draws on her own knowledge as a daughter of a chaplain to provide context and also demonstrates a keen understanding of campanology and fen drainage. Whilst some might find some of the detail tiresome, I thought it was fascinating. 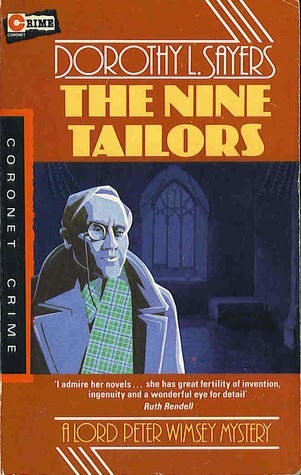 Wimsey is an engaging detective and Sayers populates the story with a number of other well-drawn characters. Where she excels, in my view, is in the character interactions, with an especially good ear for dialogue. The result is some well penned and vivid scenes. Overall, a very satisfying and entertaining read from one of the best known crime fiction authors of the first half of the twentieth century. Happy St Patrick's Day. 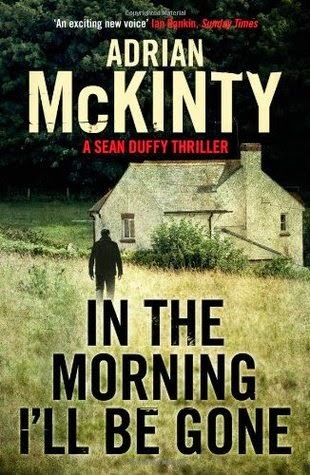 If you're looking for a good book to mark the occasion here are 10 novels by Irish authors that are worth tucking into - all reviewed on the blog in the last year or so. It was with great sadness that I heard of the passing of Terry Pratchett. He was one of my favourite authors and I've read 43 of his books, more than twice as many as any other author. Unlike many boys and young men who discovered reading through Terry's writing I was already a fairly dedicated reader when someone lent me The Colour of Magic sometime in the late 1980s. I quickly devoured the other handful of Discworld books that had been published, then over the years I purchased the others pretty much as they appeared in paperback, though I have a fair few in hardback as well. All of the books do the basics very well - strong hook and plot, good characterisation and contextualisation, great sense of place, engaging prose and style - to which Terry liberally mixed in invention, imagination, satire, and wit, using his stories as lens to reflect on social, cultural and political issues. The Discworld and its colourful set of inhabitants demanded repeat visits and I've no doubt that I'll return to his books many times in the years to come, as well as continue to thrust them into the hands of others. If I had to pick a favourite I think it would be Guards! Guards! (the first of the City Watch books). The image above was shared into my Facebook page and I think originates with Jay Jw Anthony Coates. It uses one of the last of tweets in Terry's twitter feed and I just love the idea of the luggage scooting after him. A remarkable writer and humanist whose books will be read for generations to come. The woman’s head had cracked like a soft boiled egg, brains and blood spread in a wide arc. ‘How the hell did she get up there?’ The young garda said, staring up at the tall steeple. Detective Leone Scamarcio is the black sheep of his mafia family having joined the Rome police force and become a detective. Not long after another argument, his boss confronts Scamarcio not to repair bridges but to ask him to secretly investigate on behalf of the prime minister the death of a rent boy who was photographed frolicking with a senior politician. So far the scandal has been kept out of the media, but it’s only a matter time before the story breaks. At first the case is baffling, with two other young men perishing and a fellow cop left fighting for his life, but then Scamarcio is pointed towards the island of Elba, where a young American girl has been abducted from a beach, traumatising her parents. The local cops are not happy at having Scarmarcio interfering with their investigation, especially since he quickly identifies flaws in their approach, but he gradually makes progress. The problem is that all the leads point to an even greater political and criminal scandal. Set in the city of Rome and the island of Elba, Nadia Dalbuono’s debut novel mixes police procedural with political thriller. The central character is Leone Scamarcio, a loner who is an outsider within the police force given his family’s mafia connections, who also has a mild anger management problem being unafraid to let his boss know exactly what he thinks of a poor decision or action. The plot involves Scamarcio covertly investigating a sexual scandal involving a senior politician that has become a murder case. The start of the story felt a little clunky, both in terms of its plotting and telling, but becomes more assured as it progresses, especially when the tale moves to Elba. Here, there is more of a sense of place and better framing and contextualisation. However, on return to Rome it becomes a little fanciful again and the twist in the resolution felt weak and unlikely. 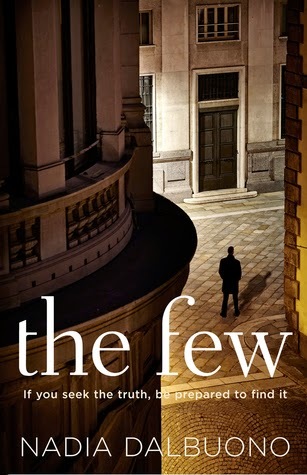 Nevertheless, Scamarcio is an appealing character and the story rattles along, hooking the reader in, and there is plenty of intrigue and tension. Overall, an entertaining read that shows promise as the start of a new series. Exposed by a newspaper, Pinkie’s boss was killed by a rival gang. Now the journalist is wandering across Brighton pursued by the gang now controlled by the seventeen year old. He latches onto day tripper, Ida Arnold, a matronly woman looking for a good time, but when she visits a bathroom the journalist disappears. Pinkie has his revenge and sets about covering his tracks, leaving a false trail of newspaper competition cards in public places. Although ruled as a natural death, Ida isn’t convinced and when the police prove uninterested, she starts to retrace the newspaper man’s steps. In Snow’s cafe she discovers the sixteen year old, Rose. The waitress soon becomes caught in the middle of the paranoid and volatile Pinkie and the formidable Ida. Published in 1938, Brighton Rock traces the aftermath of a murder as its principal protagonist tries to cover his tracks as he becomes increasingly paranoid and skittish. Pinkie has graduated from poverty to head of a razor gang working the fringes of the Brighton races. Seeking revenge his gang murder a journalist, but leave a crucial clue, which Pinkie subsequently tries to collect, meeting the naive and impressionable, Rose. Together start an unsettled relationship, pursued by the worldly-wise Ida Arnold who is suspicious of the journalists death. Greene uses this scenario to explore the themes of right and wrong, and good and evil, framed within Pinkie and Rose’s Catholic upbringing, their poverty and alienation from society, and the gang rivalry operating in Brighton. It is this framing, along with the characterisation, that is the real strength of the story adding a distinct literary sensibility to the storytelling. Pinkie, Rose and Ida are three-dimensional characters with depth that evolve over the course of the tale. The relationship between Pinkie and Rose is particularly nicely portrayed, revealing its complexities and imbalances. The plot itself is fairly linear and well telegraphed, but nonetheless still compelling as it unfolds to its inevitable conclusion. Overall, a tense and engaging slice of literary noir. Twenty months ago I started a large five year project entitled the 'Programmable City'. I thought that I would be out and about doing fieldwork, catching up on reading, and writing empirically based papers. Instead I mostly spent that time setting things up, supervising other researchers or running training courses, reading and editing their stuff, writing contextual and more theoretical papers, giving talks, and working on other projects. One of my new year's resolutions was to change that and I've spent the last four weeks out and about doing fieldwork. 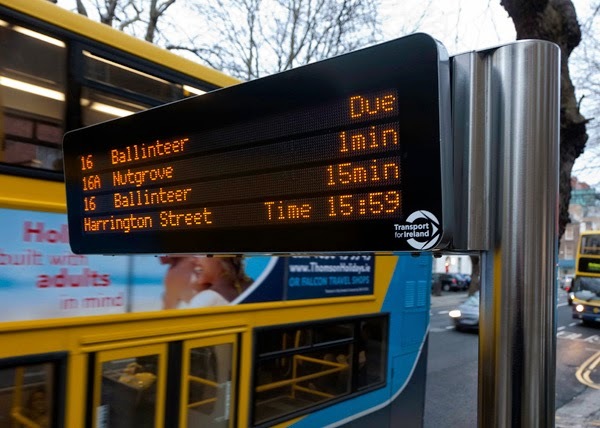 I've conducted 30 interviews so far with key informants from city authorities, state agencies, companies, and civic groups, for a project entitled 'Smart Dublin', with another 15 or so to go. It's been a real joy. And the whole process has shifted my thinking on the notion of smart cities somewhat. The key thing now is to make sure I continue to find the time for this. I've already blocked off six weeks later in the year when I hope to doing a similar set of interviews in Boston. The next challenge is to try and block-off time to process and analyze the material and write-up the findings! ‘I thought I’d put some order on the place,’ the assistant replied without looking up, sorting through a stack of tomes. Moscow, May 1876. A young man enters Alexander Gardens, propositions a rich young woman, then when rejected puts a pistol to his head and pulls the trigger. The case is initially ruled as a tragic suicide, but novice detective, Erast Fandorin, is not convinced. Suspicious of the circumstances of the death and the conditions of the will he starts to investigate. He is soon drawn into the orbit of a beautiful woman with a harem of gentleman admirers and is witness to a murder. Having persuaded his boss to allow him to follow the trail, Fandorin heads from Moscow to London, slowly becoming aware that he has stumbled on a worldwide conspiracy, placing his life in mortal danger. 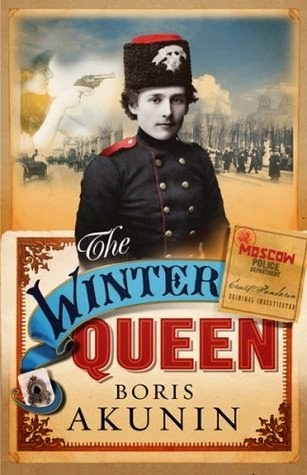 The Winter Queen is a historical conspiracy tale, following the exploits of a dashing young detective, Erast Fandorin, as he seeks to foil a dangerous plot in late nineteenth century Moscow. It’s billed on the cover as ‘Sherlock Holmes meets James Bond’, the tale is knowingly a little fanciful, focusing on the dastardly plans of a shadowy organisation. Whilst it’s got many of the essential ingredients for such a story, the only real mystery is how the detective could not fathom the conspiracy when it is in plain sight to the reader. Moreover, the conspiracy requires a little too much suspension of disbelief at times. Fandorin is portrayed as a hero with much promise as a detective, and whilst he does manage to solve the case by following his intuition, he is also naive and makes some very poor decisions along the way, relying on the intervention of others and luck. The result is that after a decent start the story is largely held together by its swashbuckling endeavours, its portrayal of upper class Moscow and its hierarchical societal structures, and pace. 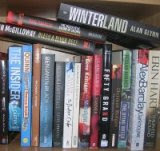 As well as posting my reviews onto the blog, I also record them on Goodreads, and put most of them up on Amazon. 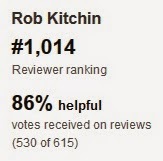 I've just noticed that my Amazon reviewer ranking has fallen out of the top 1000 and had a browse of how people have rated the reviews. 86% of the 'votes' deem the reviews helpful, which means almost 1 in 6 thought them unhelpful. Interestingly, a review of a book I gave five stars to seems just as likely to receive an unhelpful vote as a three star review. This, I think, is good as it suggests that the review is being judged on its merits as a review, and not on how strongly is favours the book. Or at least I hope that's what is going on giving how the reviewing system is often gamed. It would be interesting to know the reasoning behind 'votes', not so they can be challenged (everyone after all is entitled to an opinion), but to see if there is any useful observations that might feedback into my reviewing. Reviewers rarely get such feedback beyond 'nice review' comments - well this reviewer doesn't - but it would be incredibly useful input. So, if you've any observations and constructive critique about my reviews, please leave a note in the comment section. Thanks! 1937, aged 18, Joan heads to Cambridge University to study science. There she meets the confident and exotic Sonya Galich, a refugee from Russia, and her dashing cousin, Leo. Enchanted by Sonya and swept off her feet by Leo, Joan is pulled into their orbit and their communist agitating for worker rights and Spanish republicans. Nearly seventy years later one her acquaintances from that time, Sir William Mitchell, is being investigated for espionage, committing suicide before being exposed. Having carefully protected her past, a knock at her door threatens to expose Joan’s secret past. Red Joan is loosely based on the story of Melita Norwood, the Soviet’s longest serving British spy who was exposed in 1999. Unlike Norwood, Joan is not a committed communist, but rather went to Cambridge University in the late 1930s as an idealist, raised by a socialist father. There she meets cousins, Sonya and Leo, falling in love with the latter and joining their political circle. Together they groom Joan and once the Second World War has started and she has finished her degree they arrange a job for her as a secretary at an atomic research centre. 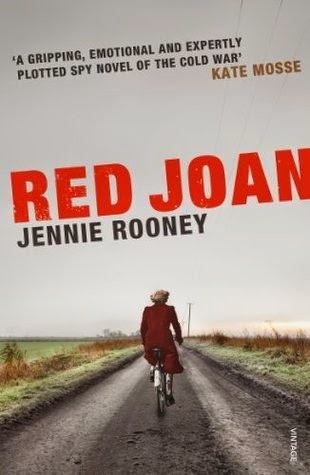 Red Joan tells her story through two interwoven strands, one set in the past, the other detailing Joan’s interrogation by MI5 whilst simultaneously trying to deal with her barrister son who has taken on the role of her legal brief. It’s a narrative structure that works very well, aided expressive prose, nicely crafted characterisation, and a carefully constructed plot. A particular strength of the story is how Rooney unsettles any straightforward black and white reading of being a traitor, providing a layered, nuanced and poignant account that gradually exposes a long held secret and its consequences, and explores themes of motive, ideology, conscience, guilt, regret, and protection. An engaging and thought provoking traitor’s tale. February was a pretty good and varied month of reading. 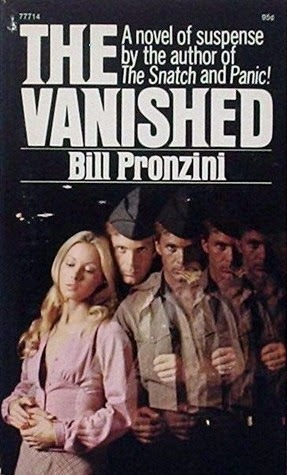 My read of the month goes to an oldish PI tale by Bill Pronzini, The Vanished. I launched Stumped and The Data Revolution on Thursday at an event in Maynooth University Bookshop. Of course, I managed not to take a single photograph! Oh well. I always feel somewhat out of place and uncomfortable at these events, but I enjoyed this one. And for once, I think I managed to thank all the people I was meant to. I've spent part of the weekend working on the next two in the pipeline, both of which are edited collections - Code and the City and Understanding Spatial Media - and are scheduled for publication in 2016. At some point I need to get back to the fiction. Usually I'm pretty good at making time, but it's difficult when it's already being used!